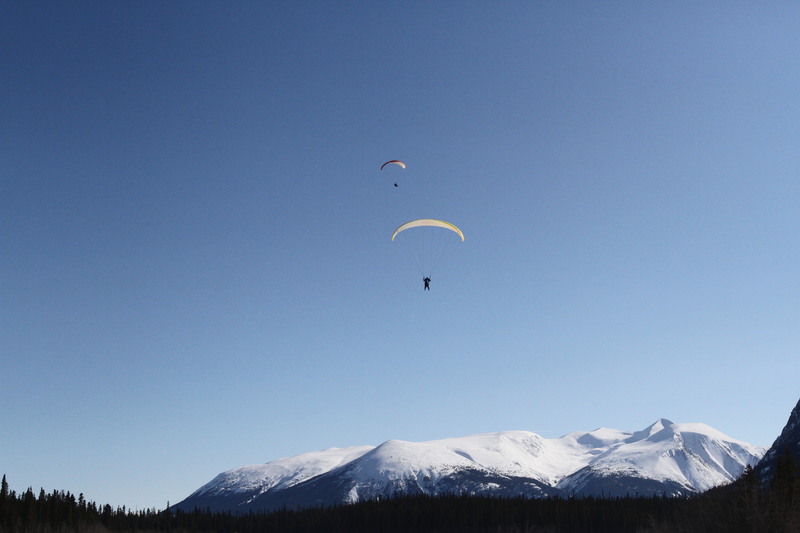 Jamie Tait has again offered to give paraglider pilots a ride up to the top of Atlin Mountain as part of the Atlin Snowmachine Hill Climb. The Helicopter can take 5 pilots/wings (flying a smaller heli for this event). The conditions are looking favourable, but… this is paragliding. There will be a base camp on the other side of the lake as part of the community event. There will be a bar-b-q, hot-dogs, hot chocolate and coffee to take a break after flying down. Multiple rides up are possible. Costs will be $75 per lift up the mountain. There will also be a heli-shuttle to and from base camp. Pilots can also bring their snow machines and ride across the lake. The races are fun to watch. Bring you binoculars as well as snacks and something to drink. Pilots should be prepared to be self-sufficient for some time if para-waiting ensues. Non pilots are also welcome to take a scenic flight. The cost is the same. Cell phones do NOT work in Atlin, but you can reach Jamie or pilots via Airband. Your Yukon medical will NOT cover you in BC. Ensure you have travel insurance or extended coverage. Cost is $75 for a single lift (based on 5 pilots). Pay Trevor directly. Trevor will be paying Jamie. Intermediate P2 Level or Higher due to the remoteness of and adverse conditions may be faced with. It is expected pilots will have ability to launch in variable conditions (forward, reverse). Have basic first aid, food and water in event you land in an isolated area. Be prepared to be on the top of a mountain for extended periods. This means clothing, a drink and snack. Paraglider packed as tightly as possible. No loose items. There is XC Potential. Be prepared to talk to other pilots. Be at the Airport in Atlin at 10am. Jamie will give Pilots a ride across lake and up the mountain. If you have a snow machine, you can also take it across the lake and be picked up at the base. We need 5 persons to make this possible, but can take as many as 8-10 persons.